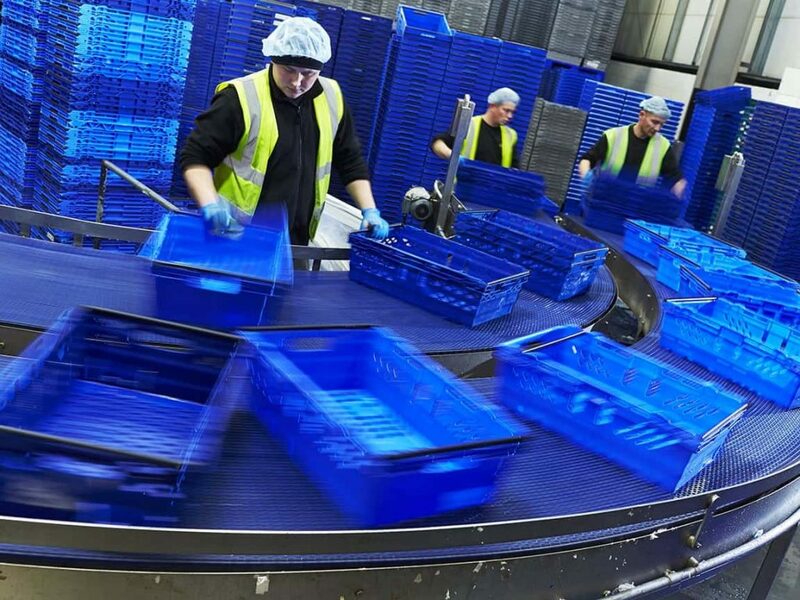 Designed, manufactured and installed by the IWM team of engineers, the T2000 was created to wash and dry supermarket distribution crates, dolly’s, plastic crates for foodstuffs and breadbaskets. Robust, versatile and easy to use, the T2000 machine has a minimum throughput of 1600 trays per hour and a maximum of 2000 for light to medium soiled trays. The trays can be loaded and unloaded manually. The high performance washing is achieved thanks to the stainless steel screw type nozzles that cover the product on a 360-degree angle. The high capacity tank holds 1500 litres of water, which is pushed through the system via six bespoke pumps with capacities ranging from 3.0 to 5.5 kW. Equipped with a triple tank and two conveyorised lanes for incoming trays, the T2000 comes complete with a blow dryer module. Once the trays pass through it, they are quickly dried by the stainless steel high velocity air-knife system coupled to the fans. Electricity, gas and water consumption are carefully monitored through purpose built monitoring systems including pulse-enabled gas, electric and water meters as well as a pulse-enabled waste monitoring irrigation meter. In addition, the remote mounted control panel accommodates the water pump motor starters, rotary filter motor starters, conveyor motor inverters, a set of gas and fan burner controls, steam extract fan motor starters, dryer/blower fan motor starters, voltage transformers for 24 V dc control, set circuit breakers and mains isolator as well as standard switchgear. Remote monitoring of energy is made simple thanks to the customised software created by IWM. The software allows users to interrogate data via a Siemens S7 PLC and a Siemen 10″ HMI. The latter displays all necessary I/O interface modules, temperature analogue I/P cards, power supplies, and fault- finding display and control software. “The project we did for PHS Teacrate was part of a major investment in plant and machinery,” explained Carl Hollier, managing director at IWM. “We offered a complete turnkey solution which helped double PHS Teacrate’s crate washing capacity and will generate up to 20 new jobs in the region. As it is our first foray into the logistics market, we hope it will pave the way for many and exciting projects of this kind”, he said.